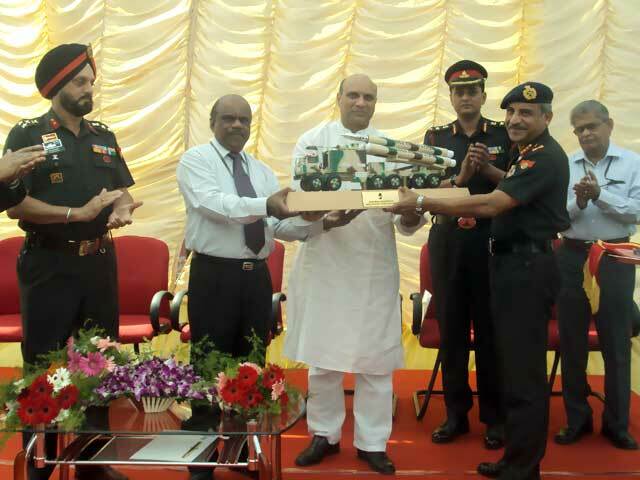 Minister of State for Defence M M Pallam Raju hands over a model of BRAHMOS missile system to Director General Artillery, Lt. General Vinod Nayanar in the presence of BrahMos Aerospace chief Dr. A S Pillai in Secunderabad on Wednesday. Handing over of new regiment of BRAHMOS Block II varient of missile system to Indian Army. BRAHMOS Block II varient of missiles was handed over during a function at Parade Ground, Secunderabad. Indian Army receives second regiment of BRAHMOS missile.